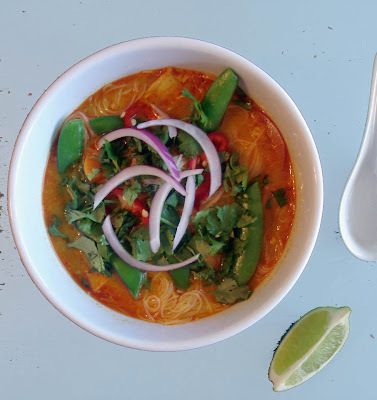 I've been looking to recreate Buddha's Belly's Spicy Tom Yom Koon soup for a while now and even though this recipe isn't really it, I thought it would satiate the craving and make for a good culinary challenge, or, what the laymen refer to as a bon appetempt. I'm happy to say, it didn't let me down on either front. And after four grocery stores, and two specialty food shops, we still couldn't find yellow curry paste and decided to substitute with the readily available red curry paste, which explains why our version isn't as yellow as bon appélittleheadsupontherarityofyellowcurrypastewouldvebeennice. 2. Either not mincing the lemongrass enough (second from the right) or leaving too many of the outside layers on. Not sure, but we kept hitting tough bits of it while trying to enjoy the broth. Anyway, let's give thai food some credit for its color palette. The end result is really one part noodles, one part soup and one part garnish. The noodles go into the bowl first, followed by the broth (with the sweet potato and chicken) and then, as garnish, the onions, cilantro, peppers, snow peas and lime. Final verdict: the soup was spicy and refreshing, but truth be told, it was a little bland. Adding salt helped, but the full fat coconut milk and the two tablespoons of sugar were sorely missed. LOVE the new look of the blog and the colorful pictures. If you hadn't TOLD me that soup was kinda bland, I would have thought it was fur-flect. I was wondering why yours looked redder. Cool blog. I didn't think it was that bland, but it definitely would have been better with the full fat coconut milk! ames, lemongrass is allllllways like that. not yo' fault, girl! super easy and delish. i always use the lite coconut milk. would the full fat make it richer? of course it would. does it matter in this recipe? not really. hello! were you ever successful at recreating the Tom Yom Koon from Buddah's Belly?? 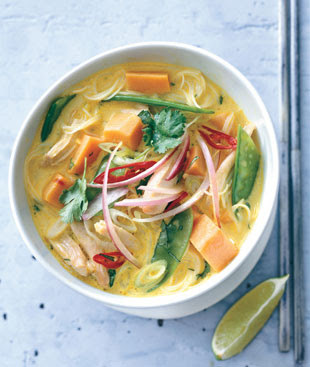 I have tried every thai soup in town (now in Chicago) and haven't found anything close! thank you!